Melissa Billington’s hippie parents introduced her to yoga while still in the womb. At age 6 she spent time at Kripalu Ashram, at 16 she began practicing Kundalini Yoga and after leaving the US in 1999 to roam India, she returned to Kripalu for her 200 hour certification in 2002. Although privileged to teach in a number of countries, Aotearoa New Zealand is where Melissa has lived the longest (since 2005) and feels the most at home. In 2008 she opened Powa Centre in Wellington and organized her teachings under the brand MYOGA which stands for Manifest Your Own Greatness thru Awareness, and which was coined with the intention that each person must “own” their own practice. MYOGA’s guiding principle is freedom to unfold. Each practice has been chosen for its efficient and effective ability to cultivate both union and liberation. MYOGA Basics recognize the value of caring for our foundations, while MYOGA Seasons honour the powers and energies within us–our chakras–as well as those without us–the seasons of our natural environment. Additionally, Melissa’s own journey with hearing loss led her to place great emphasis on the healing power of vibration and learning to own and speak Truth, found in MYOGA Sounds. 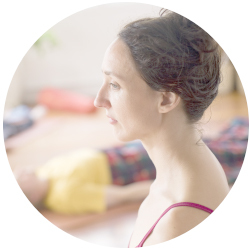 Melissa has certifications in Pregnancy Yoga (2003), Radiant Child (2009), Forrest Yoga Advanced Teacher Training (2016), and has been registered with the Yoga Alliance since 2004. She formulated and led two Yoga Alliance-certified 200 hour teacher trainings, taught on TVNZ’s Good Morning Show and also in the local women’s prison for two years. In 2014 she put most of her teachings online and in 2015 she took a “spiritual sabbatical” to question deeply what has become of the Yoga Industry. While on walkabout, Melissa connected deeply to the welfare of water, women, animals & children.